On Debian or Ubuntu systems, install the nut-hal-drivers package. GNOME Power Manager should already be running and should automatically detect the UPS. If it’s not running, you can start it from the command line or set it to start automatically in each session with the Sessions system preference. An icon will appear in the system tray if everything is working. GNOME Power Manager system tray icon and tooltip. Clicking the system tray icon and selecting UPS from the menu will give detailed information. GNOME Power Manager UPS details. GNOME Power Manager can be configured to shutdown or hibernate the computer when the UPS battery level drops below certain thresholds. There are also gconf keys to change which thresholds are used, percentage or time left, and what those thresholds are. GNOME Power Manager is not running when you aren’t logged in. If your machine loses power at the login screen, it will not shutdown automatically. Currently, the nut-hal-drivers package only supports USB-based UPS’s. Many older and higher-end UPS’s are serial-based. GNOME Power Manager’s UPS support is buggy. While it displays notifications of low battery and critically low battery, it doesn’t take any actions. See Debian bug #482431 and GNOME bug #539843.
gnome-power-manager will not power off the UPS at the end of a shutdown from power failure. This means that either the UPS will be fully drained, or worse, power will be restored before the battery is fully drained and the computer will not automatically start up again. No further work will be done on nut-hal-drivers. HAL is going to be replaced with DeviceKit and nut-hal-drivers will be replaced with DeviceKit-power. Conclusion: Don’t use nut-hal-drivers unless you really, really want a fancy notification icon. Install the nut package. This should conflict with nut-hal-drivers if it’s already installed. Replace apc with whatever you named your UPS. What’s left? Save your work, unplug the UPS, and make sure your machine shuts down cleanly. This may take a while. By default, upsmon waits until the battery is at a critically low level before initiating a shutdown. What’s the point of having 20 minutes of battery life if you aren’t going to use it? As you can see, this second method is quite a bit more difficult to configure. That said, using upsd and upsmon, as opposed to nut-hal-drivers, is probably the more reliable method of monitoring a UPS. It’s also the only option available if you need to monitor one UPS from multiple machines. Thanks, this worked a lot better than the tools that came with the MGE-Evolution-1150. Hi! Nice article. One small error though. The second udevadm command is wrong, just remove ‘control’ from it, like this “udevadm trigger”. Hi! Thanks for your excellent article from me, too. It should read udevadm control –reload-rules (no underscore in –reload-rules). Man o Man! did this tutorial work! i can finally use my not-so-smart ups to atleast shutdown my pc when battery level is low.Othewise pc just used to turn off once the ups battery runs out. Also this works flawlessly with arch! in /etc/nut/nut.conf, or nothing will start. Also, I found I had to power cycle my UPS before it would talk to nut. I’m going to do a big revision fairly soon so that I can add some info on DeviceKit-power. I’ll be sure to fix the Jaunty stuff at the same time (seems that configuration has been simplified in nut >= 2.4). Installing the nut package, should add the nut user and group. If it doesn’t, you have to add those manually = HOW DO I KNOW IF IT HAS OR NOT ??? WOT DO I LOOK FOR ??? HOW DO I ADD MANUALLY ??? Next, create or edit /etc/nut/ups.conf: = There is already a file “nut.conf” in this directory is this a typo or should i create nut.conf also??? this realy doesnt mean a great deal to me am i suposed to add this to my ups.conf or wot you guys are really confusing me with no real description ? That should get you closer with the Powerware 5110, as the config you currently have is not appropriate for the 5110. In nut.conf (already present in the nut directory) you need to add standalone as Dave suggests above. Great guide. I used it in the past to get nut working with a Powerware 5110 on Hardy. I’ve just upgraded my fileserver box to Jaunty, and naturally came back to your guide. Unfortunately I haven’t been able to get it working this time. Whenever I start upsdrvctrl it throws an error about not being able to find the Powerware UPS device on the USB bus. I’ve set standalone in nut.conf, and have the driver correctly set to bcmxcp_usb in ups.conf, but it doesn’t want to start. I’ll try powercycling the UPS as Dave suggested, when I get a chance. Maybe that is the key? In any case, looking forward to your guide for Jaunty! What’s the exact output of upsdrvctl start? I had a problem a while ago where hal was claiming the device before nut and preventing it from working right. I’d also check that it shows up somewhere in dmesg (i.e. dmesg | grep -i powerware). If it isn’t there, re-plugging in the usb cable might get it to re-detect it. sudo /etc/init.d/nut start will send a FAILED. – Run this driver as another user (upsdrvctl -u or ‘user=…’ in ups.conf). Excellent guide! With the help of the comments, everything seems to be working fine on my machine with Jaunty! Hmm… had it running fine – then updated Ubuntu and Nut and now it doesn’t work. ACL, ACCEPT, REJECT no longer accepted in upsd.conf use LISTEN instead. Any idea on how to change the configuration to make it work again using LISTEN? All I can find on Google are Bug reports stating that this change was made and not documented anywhere. address. This may be useful on hosts with multiple interfaces. be subverted on many systems. Thanks! This is the first comprehensible info I’ve found to get nut 2.x working. Everything else I’ve found (including readme’s etc.) is commentary, editorial, history lesson, etc. ; not instructional. My ups.conf is exactly the same as the example, I’m using debian 5.0.
which moved me forward a bit. I don’t know that this puts me in happy land, but I wanted to post this clue before I forgot. You have to grant access to nut user to usb device..
That helps me after rebooting only. So try to reboot after configuring permissions and so on.. This made an old, –no, ancient– APC UPS-PRO 650 (serial connection) work “smart”(er) under Karmic. I am trying to configure NUT to communicate with a Mecer ME600BK UPS connected via a serial cable to a standalone machine on what I assume is ttyS1. To be sure I have also tried on ttyS0 (locked by another process) and ttyS2 with a similar output as given below. When I set the configuration to use ttyS0 I am told this port is locked by another application. My guess is that the UPS is actually on ttyS0 and some other process has it open. Try running lsof /dev/ttyS0 to see what program is using it. Remove the second = between KERNEL and “ttyS0” helped. Error: Connection failure: Connection refused. Thank you for the assistance, I have come back to this again and made some progress, but it is still not working properly. I have put the double “==” back and done the restart. “lsof” (given as sudo) shows the port “ttyS0” is connected to the ups and controlled by the megatec driver. So far so good. Everything then very much progresses as expected with no error messages and the predicted response. I just don’t understand this, do you have any further ideas? First, make sure that sudo /etc/init.d/nut restart completes with errors. If it does, make sure that /etc/nut/upsd.conf is exactly like the sample above. I’m getting the same error when trying to run the upsc command, everything else seems to work find. I’m fairly new to both linux and ubuntu. been googling the hell out of all this trying to figure it out. 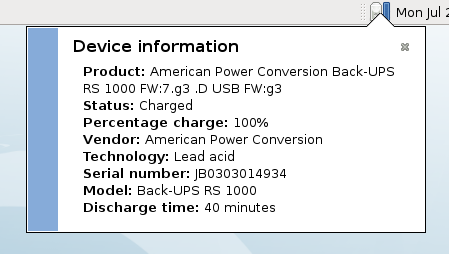 the information seems to be getting through as I can unplug the ups and the computer detects it and pops up a little message saying ups is discharging, but never shuts the computer down, will totally discharge unit and Loss of Power turn it off. Seems like its conflicting with the built in power management gnome as the ups info gets displayed through there. I had originally installed the nut-hal-drivers when starting your guide but then removed the package and started just the nut package. sorry to resurrect this and not sure if anyone is still monitoring. Something’s probably wrong with /etc/nut/upsd.conf. What’s in that file? yes the /etc/nut/nut.conf mode=standalone was my missing link. after adding that in I did a fresh boot and loaded up the upsc command it is showed the ups unit information, then pulled the plug and the unit displayed it was unplugged in the upsc screen then shut down the system. Thank you for you help, been over this guide so many times but I had clearly overlooked some of the important comments. Thanks again, everything appears to be working correctly now. Glad you got it working. Unfortunately, nut 2.2 -> 2.4 was a big change to how configuration worked and I just haven’t had a the time to update the guide. Ok I changed the info to LISTEN as noted above, then also tried just clearing out the file completely and leaving blank. This is with # /etc/nut/upsd.conf Blank after fresh boot. Does not shut down computer when unplugged. This is with # /etc/nut/upsd.conf as follows after fresh boot. Does not shut down computer when unplugged and drained…. So clearly not starting on boot, and I’ve missed something to configure how it shuts down the system? I got an Liebert PowerSure Personal XT connected to Ubuntu 9.10. I follow your steps and after read the comments, everything is going fine. im using Ubuntu 9.10 server 64 bit. And have problems to start nut. all the setting are done, how they are listed above, with an other dist i think it was 8.04 it runs perfectly, but i don’t know wath nut version ist was. today under 9.10 i use 2.4.1.
the problem is that upsd doesn’t start at booting, i think becourse of missing promissions. lateron starting by “sudo upsd” it work fine. but this is no acceptable solution. What error are you getting from running sudo /etc/init.d/nut start? mention solutions to particular problems. but the start on boot is not possible, only by starting with sudo. Do you have “MODE=standalone” in /etc/nut/nut.conf? no i use netserver option. Nothing pops out, but a quick search shows that other people have gotten your UPS to work. I’ve also tried to set a specific usb port and change driver. “USB to Serial” from your lsusb output suggests to me that it won’t work with the normal usbhid-ups driver though. It’s probably using some other serial protocol with a serial to USB converter. May be worth a mention to the web page for monitoring you get with it, using nutd and upsmon. At least with Ubuntu 9.10 (and apache, of course). Hi guys. I have a very strange situation here. I’ve just installed and configured upsmon in fedora 12. The pc is connected on a Mustek Powermust 2000VA USB with serial port (ttyS0) and the upsd can communicate with the ups without a problem. Everything works great except one thing, when I shut down the pc the ups is also turns it’s load off, it’s like running the load.off command, therefore all the devices on the ups are turned off (adsl router, switch etc). The only way to restore the power is to turn of the power on the ups from the front button, remove power cord, wait 2-3 secs, restore power on ups and turn on from the front button. Does anybodby knows why this happens. It seems like the os sends a load.off command during shutdown. Also if I kill the upsd daemon before send a shutdown then the same thing happens. Only if I disconnect the RS-232 cable before shut down the ups stays on. Nice guide. I had no problems getting my Cyberpower AVR1000 running with this guide on Ubuntu 10.04 64-bit, although I did have to set MODE=standalone in /etc/nut/nut.conf. It took me a while to get this up and running. I have to servers and one UPS. The server host names are named after our two cats, but changed here to felix and garfield. Both servers receive power from the UPS. The UPS is connected to a regular power outlet. The UPS is a Eaton Powerware 5110 1000Va. The felix system is connected to the UPS by USB. So felix will be the master and garfield is slave. They have local addresses 192.168.0.1 and 192.168.0.2. # no need to comment on the passwords, right? # This line basically says: I want to monitor my UPS Power5110 that is connected directly as master to my system localhost. I have only 1 UPS, my username is nut_master and my password is PWM. # No lines edited here. The NUT daemon runs on master felix. # No lines edited here. The users are defined on the master system felix. Hopefully this will be useful to someone. Stated like this, it’s not a difficult configuration. I took me a few hours though. Please feel free to remark. But I must warn you: I’m just a user. Most things I do not understand really. UserFrodo @ Rotterdam. Sunday, November 7. It’s 7 decrees Celcius. Few clouds and showers. Thankyou dude! i’m using same scheme for ups. First of all, it is a great tutorial and read a lot of comment. But I have also a problem with nut. Any advice or some comment about some wrong config code. Here are my config files. My ups is an Atlantis Power OnePower 652 (usb) on Kubuntu 10.10. I tried all the drivers. No one can help me please ??? Thank you so much. I was having the same problem with ubuntu 2.6.35-27. You saved me and I learned something about linux. Seems that rebooting was enough and finally succeeded thanks to comments (guided by errors in /var/log/daemon.log). Looks like everything is working on my system until I get message in the end that UPS in uneveilable. Please advise where and what is the problem? I had a similar problem a while ago and it was just a flaky driver. Different ups, no problem. That said, if that message is coming from upsmon check that it can communicate with uspd. When I type “sudo upsdrvctl start” it gives me the following error. Does it work if you just mkdir /var/run/nut and chown nut: /var/run/nut? Is your UPS on the supported list? upsd chroots before opening any config files, so there is no way to add support for that in upsd.conf at the present time. is the user who will control communication to the UPS, launched by the upsdrvctl program). I created one named nutsrv to run all services. With the user specified in both places, NUT will start the drivers and upsd as the same user and will be able to communicate. If you are implementing the CGI interface to supply a web interface to your monitoring, the hosts.conf, upsstats.html, and upsstats-single.html should be world-readable (or made readable by ownership or permissions to both the nut group and the group under which your web server is running). The other configuration files can be restricted to the nut group only. Some parameter got chopped out of my reply. The ups.conf line should be “user = run_as_user”. The upsd options line should be “UPSD_OPTIONS=”-u run_as_user”. I’m surprised no one who has posted a response this year (2013) has mentioned that this guide doesn’t work with version 2.6!!!!!! btmorex admits that himself. I have nut version 2.6.4-2.3 (running on Debian Wheezy). There’s no /etc/default/nut or /etc/init.d/nut file. Instead, I have /etc/init.d/nut-server and /etc/init.d/nut-client. No more ACLs either. Instead, upsd.conf contains LISTEN statements. So what are you people doing? Trying to configure some old version of nut on an old version or Debian? Arnaud Quette can consider himself lucky that Debian allows packages to be hosted without any proper (and more importantly up to date) instructions on how to use them! Could someone please post a link to a guide which is up to date? Else I’ll have to go buy an APC UPS just so that I can use apcupsd. 1.) The comments contain useful information on getting it working. 2.) Tons of people still run servers on older Linux version and this guide is still relevant (mostly). Still usable with Kubuntu 14.04 LTS as TrippLite drivers from the manufacturer are limited to Fedora and Opensuse package. Was very usefull, hope you read my comment and thank you. Hi I wondered if you can please help. My server runs Ubuntu 14.04.3 and I’ve installed nut as your guide and can see the monitoring is working and I’m getting the readouts etc. But when I test unplugging the power the ups drains down until the server turns off but is not shutdown. Is there please a way to get ubuntu to gracefully shutdown when the battery level is low rather than just dying. Seems like I may as well not have a UPS at all? I was experiencing issues with my APC UPS after having it not plugged into my linux server for about a year. I plugged everything and fired it back up, only to experience nagging messages through the console about lost communications with the UPS. I came across your guide and the rules.d update about changing it to ttyS1 was the fix in my case. My guess was that the UPS was plugged into a different root hub than last time. Anyway, thank you for the guide, it helped me out ! The unstable UPS state could arise from the Virtual VMware USB Hub, from the host USB 2.0 (or 3.0) port or even from additional hardware USB hub (used to connect few UPS devices to the same monitoring station). For example, with SysV inittab reborn monitoring process – let’s name that executalbe (755) file nut-usb-shake in the /etc/nut folder. Finally reload the inittab context with “init q” and every-time when the monitored message is intercepted in the syslog, the remediation commands will be executed. You can adjust to monitor and execute whatever will serve your needs – the above is just an example. Can anyone point me towards a more recent article useable with Ubuntu 18.04 LTS (“Bionic Beaver”)?? Thanks in advance, and thanks for the above nonetheless.